Other centres which were also canceled include Shillong and Kathmandu. Till last year, the entrance examinations in Jawaharlal Nehru University (JNU) would be held in the month of May. In what many are calling a strategy to avoid the admission of Kashmiri students in the JNU, the administration had decided to prepone the exam deciding to conduct it in December. 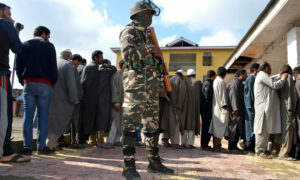 The list which shows the entrance examination centres has an enforced disappearance of the Srinagar centre. The candidates have received an email asking them to come to Jammu to appear in the examination to be held on December 27, 2017. While that may be an expensive affair for most of the students, the authorities seem to be unmoved by the inconvenience and requests of candidates, JNU Students Union and PhD scholars from the varsity. Two PhD scholars Aejaz Ahmad Rather (Councillor at School of Social Sciences) and Malik Altaf Hussain have raised the issue with the authorities. Narrating the sequence of how Srinagar centre got cancelled and what are its consequences, Altaf told Free Press Kashmir that the JNU professors this year held a meeting to conduct the entrance test in December instead of May. The prospectus released this year had Srinagar as one of the examination centres. In 2nd week of November, according to Altaf, some Kashmiri students texted him, also raised the issue on social-media, that they had received an email from the JNU administration stating that the Srinagar examination centre has been cancelled. “The students asked us to do something about it. We informed the JNU students union (JNUSU). They did not do anything significant. They wrote a letter and gave it to the administration. It responded by saying that the centre was cancelled because of the winter vacations there. So Aejaz and I took an initiative, wrote an application, met the controller examination and other officials. They assured us that they will do something about it. They probably tried as well but nothing happened,” says Altaf, adding that the duo had also recommended some alternatives in the application. Pertinently, other state level examinations or the National Eligibility Test (NET) are conducted during the winters in Kashmir. The recommendations included the proposal to shift the centre to other colleges in Kashmir. “We had already spoken to the administration of these colleges. They had no issues with it. They were willing to conduct the examination if they would get an official request from the administration. We also mentioned the email IDs of these colleges in the application,” he says. But the administration disappointed what Altaf assumes to be a number of at least 400 to 500 aspirants by declaring the cancellation of the centre despite many alternatives available to them. The duo says it had knocked many doors. The candidates left with no other option than to either give up studying in JNU or spend a good chunk of money for it. The students will have to book an expensive ticket and book rooms in the hotels. It will take them 3 days to go to Jammu, look for a place to stay, locate the examination centre, write the exam and come back to Kashmir. Some of the students have opted for more than one subject. For them, the stay is going to be longer. FPK tried to contact the JNU officials and JNUSU President Geeta Kumari. Dr. H. Sharma, Controller of Examination and Geeta did not respond to the calls while Milap Punia, Director of Admission JNU’s phone was switched off. The administration might cancel the centre next year as well or even permanently, believes Altaf who like many other Kashmiris feels that the move is basically a strategy to not admit Kashmiris in the JNU for the protests that erupted inside the campus in 2016. “This seems to be done on purpose. The strategy was not to have any Kashmiris on campus after the last year’s JNU incidents,” says Altaf.